Annie Turnbull has lived through both the First and Second World War and has seen 25 Prime Ministers in power. 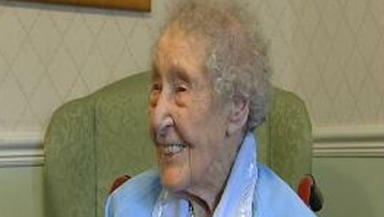 Scotland's oldest person is celebrating her 111th birthday in Edinburgh today. Annie Turnbull has lived through both the First and Second World Wars and has seen the introduction of electricity and stainless steel into the home. She was born in Stoneyburn, West Lothian in 1898 and now lives in a care home in the capital. Celebrating her birthday today, she told STV News her longevity was down to: "Good parents, a good home, a happy childhood in Stoneyburn and a happy life. She added: "An interesting life and many, many friends - that's my secret!" Annie moved from West Lothian to Edinburgh in 1913 and stayed in the city throughout the First World War. She said: "1916, the first zeppelin came over and dropped a bomb in Leith- I think it was Lindsay Road- and dropped two in the Grassmarket. There was a big fire in Leith. Of course, we weren't prepared." Annie speaks of a time before televisions, washing machines and even stainless steel cutlery. She also says the lightbulb has made a big difference to everyday life in her many years. "It used to be candles, then paraffin lamps and then we got a petrol lamp - that was better. But then we got electricity, that was a godsend." Annie now lives in the Victoria Manor home in Edinburgh and is visited regularly by her daughter, herself into her seventies. Reacting to today's milestone birthday, which takes her into her twelfth decade, Annie said: "It doesn't faze me. I know it's just age! "It's certainly a wonderful thing, especially to feel so good. I was just happy all the time." But she says she isn't holding out to become the oldest person in the world. "Enough's enough! I've really been lucky, not having any illnesses or anything. I feel well enough in myself, but my bones are all breaking to bits! I'm suffering from wear and tear." The title of world's oldest person is currently held by a 114-year-old Japanese woman, Kama Chinen.